Star trails decorate the night sky above the rotating dome of Terkan Lajos public observatory near the city of Szekesfahervar in central Hungary. Tamas Ladanyi of The World at Night took this image near Szekesfahervar, Hungary on Feb. 21, 2012. Bright stars gleam over the rotating dome of Terkan Lajos public observatory near the city of Szekesfahervar in central Hungary in an eye-catching view from a veteran night sky photographer. This image was taken by astrophotographer Tamas Ladanyi of The World at Night on Feb. 21, 2012. The constellations of Orion and Taurus can be seen above the dome. The bright trails of Venus and Jupiter can also be seen in the lower right of the image. Star trails are features in photographs that are created by taking a picture of the stars from a fixed point for a long period of time. As the Earth rotates, the stars appear to rotate across the sky and a photographer can capture this movement. 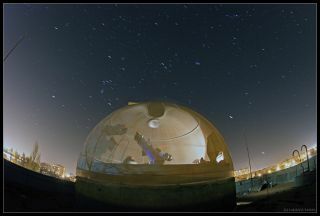 While most observatories are far away from cities to reduce light pollution, the Terkan Lajos was built in an urban area so the public can have access to beautiful images of the night sky. Follow SPACE.com for the latest in space science and exploration news on Twitter @Spacedotcom. We're also on Facebook and Google+.